The problem with growing Sweet peas is knowing when and how to plant the different varieties. They are annuals, and are a favourite in cottage gardens as well as in containers and hanging baskets, easy to grow and with great fragrance here are our top tips for growing sweet peas. Tradition has it that Sweet Peas are summer flowering, today you can get winter flowering and spring flowering varieties. And its all about the amount of light they need to grow and flower successfully, the winter types only need around 10 hours of light a day, spring flowering need 11 hours and summer flowering types require around 12 hours. A long time cottage garden favourite, Sweet Peas or ‘Lathyrus odorous’ are not only easy to grow, they are covered in colourful flowers in spring, but they are also wonderfully fragrant. You can get Sweet Peas to repeat flower simply by deadheading regularly and not letting seed pos form, if you do this, you can have flowers for months. How to grow sweet peas from seed. You need a sunny position in the garden and a humus rich moist soil. Sweet peas can be grown in containers and the dwarf varieties are a favourite in hanging baskets. The summer and spring types are generally the most hardy, so if you are starting out, they are the easiest. From planting to flowering, Sweet Peas will take around 12 to 20 weeks, depending on the climate, soil and variety. Prepare for planting by digging in some well rotted compost and add a little garden lime as well. The best time to do this is around 2 months before you plant, it gives time for the soil to settle before planting. Sweet Pea seeds should be planted at around 2cm deep and 10 – 20 cm apart depending on variety. Be a little careful with fertilizer as if you supply sweet peas with a nitrogen rich environment they will produce wonderful green growth and few flowers. At the same time install a trellis or climbing frame. Sweet peas love to scramble over something, in fact just about anything. The taller varieties can easily reach 2m in height. As it comes to the end of summer its time to soak those seeds overnight, this will speed up germination. Some gardeners like to scarify the seeds as well, however be a little careful hear as you can damage the growing point of the seed. Plant the seeds directly into the soil at around 3cm deep. 15cm apart will give you a good coverage. You can also start the seeds off indoors earlier than you can outdoors, we suggest using small biodegradable pots, rolled up newspaper tubes, or even toilet rolls. Anything that is biodegradable that you fill with soil plant a seed in and then plant into the garden or a container. Remember that some varieties will reach up to 2m in height others are not so tall, with trailing varieties reaching around 1m. We also have the ‘dwarf’ sweet pea varieties, these will reach around 30cm. All are available as seeds or seedlings for sale from nurseries and garden centers. We generally prefer to grow from seeds as seedlings are a bit of a pain to transplant. Some varieties are simply more fragrant than others, however fragrance is also influenced by temperature and humidity as with many plants. We like to water sweet peas in with a liquid seaweed fertilizer. This is the moment when gardeners loose a few seedlings. Snails love any new shoots, and birds are also attracted to the new seedling’s. Another problem is earwigs, they also like the new shoots. So spread a little wood ash or sawdust around to discourage the snails. Use a little bird netting or chicken wire to keep the birds off. Once the sweet pea seedlings are 10 cm tall they are pretty safe from snails and birds. 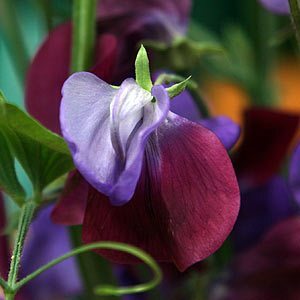 You can buy sweet pea seeds at most good nurseries, usually in both mixed and single coloured packs. 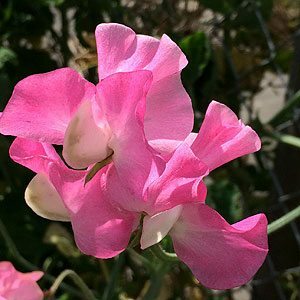 The best time to plant sweet pea seeds will depend on the variety. Early varieties are sown in autumn for spring flowering, late varieties can be sown in spring for summer flowering. As for fragrance, some are better than others. Some have very little fragrance others have lots. Many of the older varieties have great perfume. If you are looking for some really good varieties, great colours and some with great perfume, try Dr Keith Hammett in New Zealand. Varieties such as ‘High Scent’, More Scent’, High Society’, Original, being amongst the most fragrant. The ‘Spencer’ Sweet Peas are very popular, fragrant and long stems. The ‘Spencer Ripple Mix’ and ‘Spencer Giant Mix’ are two to look for.